Cognitive changes in older women receiving chemotherapy are poorly understood. We examined self-reported cognitive function for older women who received adjuvant chemotherapy on Cancer and Leukemia Group B (CALGB) 49907. 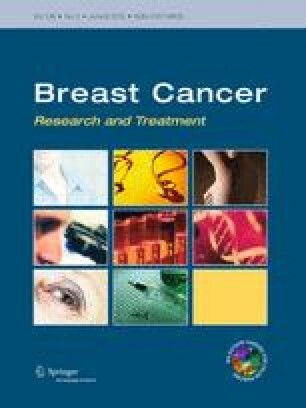 CALGB 49907 randomized 633 women aged ≥65 with stage I–III breast cancer to standard adjuvant chemotherapy (cyclophosphamide–methotrexate–5-fluorouracil or doxorubicin–cyclophosphamide) versus capecitabine. We examined self-reported cognitive function in 297 women (CALGB 361002) who enrolled on the quality of life substudy and had no gross impairment on cognitive screening. Women were evaluated using an 18-item instrument at six time points (baseline through 24 months). At each time point for each patient, we calculated a cognitive function score (CFS) defined as the mean response of items 1–18 and defined impairment as a score >1.5 standard deviations above the overall average baseline score. Differences in scores by patient characteristics were evaluated using a Kruskal–Wallis test. A linear mixed-effects model was used to assess CFSs by treatment over time. Among 297 women, the median age was 71.5 (range 65–85) and 73 % had performance status of 0. Baseline depression and fatigue were reported in 6 and 14 % of patients, respectively. The average CFS at baseline was 2.08 (corresponding to “normal ability”), and baseline cognitive function did not differ by treatment regimen (p = 0.350). Over 24 months, women reported minimal changes at each time point and insignificant differences by treatment arm were observed. In a healthy group of older women, chemotherapy was not associated with longitudinal changes in self-reported cognitive function. Presented at the San Antonio Breast Cancer Symposium (December 8, 2012). We thank all of the breast cancer patients who shared their experiences while participating in this study. We also thank Dr. Andrew Saykin for his guidance in using his cognitive function measure and Jacqueline Lafky for her administrative and logistical support. We acknowledge support from Celgene provided through the Cancer and Leukemia Group B Foundation Young Investigator Award [RF]. This research was also supported in part by the National Cancer Institute at the National Institutes of Health [Grant # U10 CA 84131, CA 127617, CA096940, and CA129769 to JSM] and by the National Institute on Aging at the National Institutes of Health [Grant #CA85850 to HM]. The research for CALGB 49907 was also supported, in part, by the National Cancer Institute at the National Institutes of Health [Grant # CA31946 to the Cancer and Leukemia Group B (Monica Bernagnoli, MD, Chairman) and Grant # CA33601 to the CALGB Statistical Center (Stephen George, PhD)]. The content of this manuscript is solely the responsibility of the authors and does not represent the official views of the National Cancer Institute at the National Institutes of Health or the Cancer and Leukemia Group B. Cancer and Leukemia Group B is presently part of the Alliance for Clinical Trials in Oncology. The sponsors had no role in the design, methods, subject recruitment, data collection, analysis, or preparation of this manuscript.